MODERN MALWARE: THE ONLY CONSTANT IS CHANGE. Cyber attacks once were mainly the concern of governments, large corporations and other highly visible networks. Not anymore. The financial rewards generated from the theft of credit card information and other sensitive data gave rise to a new breed of malware, the polymorphic threat, and with it, the amount of malware has skyrocketed. 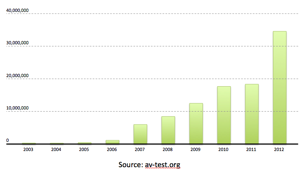 This figure from AV-Test.org, tracks the rise in malware. An estimated 200,000 new malicious programs are launched every day. Most of today's malware is polymorphic and highly adept at changing its identity to evade standard, signature-based security platforms. Alone, these platforms will not recognise as many as 88 percent of these threats. * Advanced persistent threats, or APTs, increase the threat level by employing sophisticated evasion capabilities to get payloads past a network's defenses where they persist, undetected. APTs are targeted to an organisation or a specific technology and often leverage zero day vulnerabilities - flaws for which no patch is available and no signature has been written. Any organisation can become a victim. 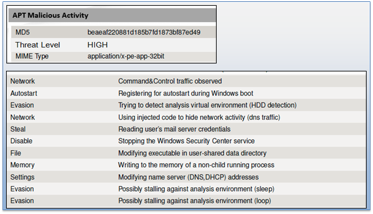 Instead of focusing on signatures of known malware, WatchGuard APT Blocker focuses on behavior analysis to determine if a file is malicious. APT Blocker identifies and submits suspicious files to a cloud-based, next-generation sandbox, where code is analysed, emulated, and virtually executed to determine its threat potential. WatchGuard APT Blocker's advanced malware analysis also uses machine-level emulation to detect advanced forms of evasion such as disabling security protocols, changing security settings or stealing passwords. APT Blocker's full-system emulation approach to sandboxing provides simple, rapid protection that scales to inspect millions of objects at any given time. Real-time visibility into attacks is critical and minutes count. Security alerts that are buried in log files are just noise. And services that take hours or a day to protect leave networks vulnerable. That's why WatchGuard APT Blocker is fully integrated into WatchGuard Dimension™, the award-winning security intelligence and visibility solution that is included at no charge with all WatchGuard UTM solutions. On one pane of glass, WatchGuard Dimension provides instant visibility with email alerts, real-time log analysis and the ability to drill deeper, alongside other top trends, applications and threats. Keep your data safe from cyber criminals with WatchGuard APT Blocker. See how by downloading our APT whitepaper. * Malwise-An Effective and Efficient Classification System for Packed and Polymorphic Malware, IEEE Computers, June 2013.